We are a family friendly Theatre with a Cafe / Restaurant. We have multi level lounge areas where your dog can sit and we offer full restaurant service in very comfortable surroundings. The only restriction is that dogs are not allowed in the formal dining area to the left hand side of our main bar. What a great find! 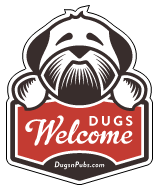 Relaxed atmosphere and good food and dog friendly too… ideal. Great to see some of our K9 friends this week at the Byre, enjoying the christmas spirit accompanied with fantastic food. Merry christmas from the Byre!